I’ve now been reviewing outdoor equipment for over ten years–sometimes here, oftentimes in magazines. One of the things I’ve learned is the importance of giving the product some time to really break in and show its strengths and weaknesses before jumping to conclusions. This, of course, differs in many respects from the reviews you usually read, which I will tell you typically are written shortly after a new product is released (and often without the writer ever getting to actually use the product). That’s just the nature of production and writing cycles; new thing gets displayed at the show but is not available for months, magazine needs a review in time for the Christmas buying season two to three months after the show concludes. Ipso facto, many reviews are based on less than 15 minutes of actual face time with the product. Fortunately for you, dear reader, I am really hard on boots. After wearing out my last pair of Simms (the venerable but narrow L2s) and quickly killing a backup pair of Cloudveils (which barely made the market and subsequently sat on a shelf in my garage for nearly a decade), I decided to really focus on something that could handle the amount of mountain hiking I do in my winter season. In a typical year I will hike well over 100 miles in my waders, often in relatively rough terrain. I needed strong support, but light weight, and I absolutely needed felt because I could not afford a slip and fall alone in the backcountry. Whatever the marketing tells you right now, felt still offers better traction than even the best rubber soles, at least when in the river. The ecological tradeoffs are not an issue for me as I have a pair of rubber soled boots which I use in new waters. To shorten a long story, I snagged a pair of Simms Vapor Boots with felt bottoms. My first use of them was in Iceland (being brand new at the time, this meant I didn’t have to go through a disinfecting process on the way into the country). The downside was immediately obvious: these boots really require some break in time. The sides, a rugged matte vinyl product, are akin to off-road tires and initially are just as inflexible. I made do, hobbling around the sheepfields of East Iceland like a skier toddling into the apres-ski lodge for a hot chocolate. Fortunately, the Vapors break in quickly–about 2 to 3 wears. And once they break in, boy howdy. These may be the best wading boots I’ve ever worn. Some things I really liked: unlike the older L2s, the toe box on these is quite substantial. Simms has used the same basic lacing system for years and has it well-dialed; one tug on the strings and the boot slides into shape perfectly. This model sports a dedicated metal catch ring for your gravel guards, which is an absolute stroke of genius (while also making you wonder why this hasn’t been a standard feature for years). Simms has procured all-black felt for the bottom, a nice touch since white felt boots typically look pretty moldy after only a few uses. As always the felt is stitched to the sole, which in my experience completely prevents the kind of felt delamination which so plagues other brands’ boots. Even after the stitch loops are worn through, the “vertical” stitch points which remain embedded in the felt serve as a kind of rebar-in-concrete to hold the glue in place. Frankly put, I have never had a pair of Simms felt soles detach. Color wise, I find I rather like the snazzy black space boot look. Simms has stamped its leaping trout directly on the top of the toe, but otherwise eschewed the kind of very-flashy design which has bled over in recent years from its forays into the bass market. 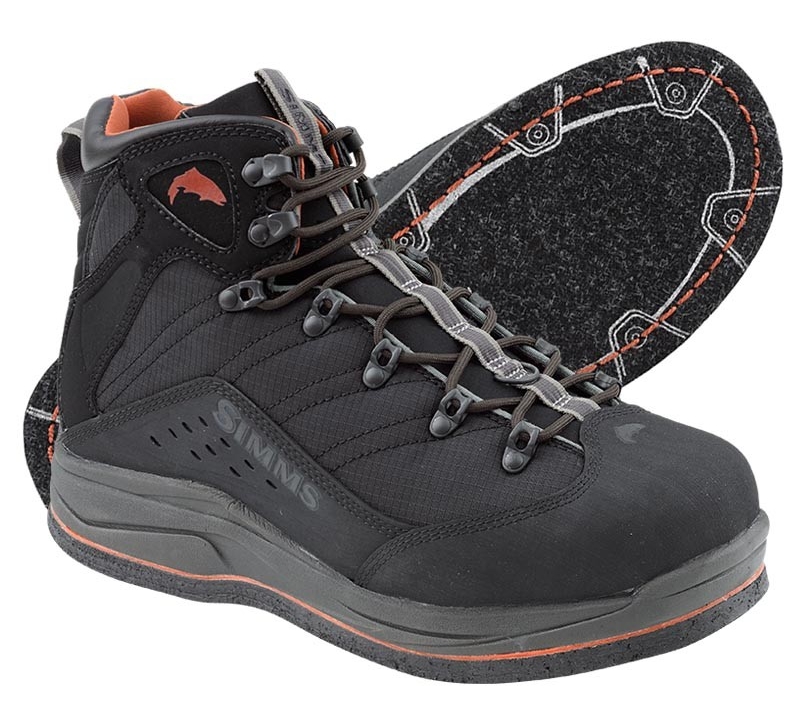 The tongue of the boot is a neoprene product, giving it tons of stretch and making it very comfortable indeed. Total weight at 51 oz. is comparable to underbuilt Converse All-Star style “ultralight” competitors, and almost half a pound lighter than the classic G3 Guide boot. (Side note: the current “flagship” model G4 BOA boot is very similar to the Vapor, but adds nearly $100 in cost as well as several ounces of weight. Both Simms models are significantly better looking than Patagonia’s new “Foot Tractor” flagship). At $169, you pay for luxury with this boot, but you save almost a hundred bucks off the nearest equivalents, at very little (or no) loss in actual performance. For the hiking angler or someone just looking for a boot that will wear like it costs, this is the market sweet spot right now. Price: $169, available at local retailers (wear a half size up from tennis shoe sizing). Rating: 4 Stars out of 5 (initial demerit for significant break in period, but 5 stars thereafter). One Response to "Simms Vapor Boot – Felt"